Initially presented at the 2013 Venice Biennale, Bedwyr Williams’ The Starry Messenger has now found its way to Manchester, in a newly adapted version that includes pieces from the Whitworth’s collection in order to expand on the imagery and themes presented in Williams’ work. The works from the collection mostly comprise of pieces from the Musgrave Kinley Outsider Art Trust (acquired by the Whitworth in 2010), perhaps demonstrating that Williams has a greater affinity with outsider artists, these enigmatic, wildly imaginative figures existing on the fringes of society. Alongside these pieces are works from Hogarth and Hiroshige, as well as pieces from the Whitworth’s wallpaper collection, and while it’s nice to have an excuse to get the Hiroshige pieces out, the whole collections display doesn’t make much of a meaningful contribution to the exhibition, other than as a demonstration of Williams’ personal taste. Accompanying the collections display in the first room of the exhibition is Williams’ Wylo, a shrunken home observatory that begins the exhibition’s ongoing theme of playing with scale, as the viewer can either loom over the observatory to examine it via the opening in the roof, or crouch down to peer through the crack in the door. The amateur astronomer inside hides from view, we can only hear him weeping, which according to the artist, is because he hasn’t paid his gas bill… similarly to the inclusion of outsider artists, this seems to indicate a connection Williams’ feels with the eccentrics in society. Moving into the second room, Williams continues to toy with scale with The Northern Hemisphere, a huge coffee table covered in various domestic objects. This, along with Wylo puts the viewer in the role of Alice or Gulliver, exploring these altered states and inevitably considering our own size in the process. Wylo, along with The Depth and Boulders, essentially function as set dressing for the titular film, The Starry Messenger. As individual pieces they simply seem to contribute to a general atmosphere in support of the film, and as such, it’s easy to breeze past to the main event. The film loosely follows a mosaic dentist as he goes through the process of transforming into a small piece of stone, of being trapped in various geological formations, of being ground down further still, into a smoother, flatter piece. Although we are nominally following the aforementioned dentist, Williams in fact puts the viewer in the role of protagonist, using his narration to address them directly throughout his absurdist tale: ‘you are as a pebble, no bits’, ‘you are in serious flapjack’, etc. This, along with Williams’ choice of imagery – teeth falling out, mud cracking like skin – makes watching this film into a physical experience. Later in the film it’s hard not to wince with pain when seeing pieces of stone broken up into mosaic pieces, you are that piece of stone. The focus on bits, mosaics and individual pieces of stone contrasts with the allusions to stars and the cosmos throughout the rest of the exhibition, the scale not only ranges from a small observatory to a large coffee table, but from an individual pebble to the cosmically large, and ultimately, no matter what size something is, it is just one piece, one bit of something grander than itself. Image courtesy of Whitworth Art Gallery. 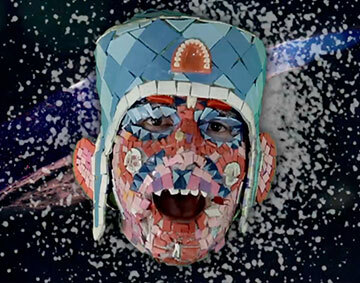 Bedwyr Williams: The Starry Messenger, Whitworth Art Gallery, Manchester. 8 August 2015 – 10 January 2016.